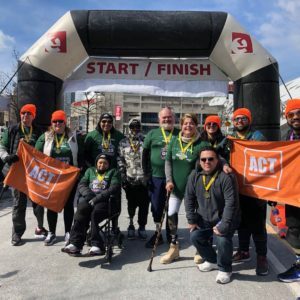 This year also marked the first year that the Amputee Coalition of Toronto would participate in the run with its very own team of 13 people. Together the ACT team raised over $600 in support of Holland Bloorview Kid’s Rehabilitation Centre. A very worthy institution doing great things for children and youth living with a disability. That’s right, we sent a team 13 people strong in our first year. That’s not including some of our newest members of the ACT family there to support their rehab centres. Every one of them crossed the finish line too. Every one of them smiling as they crossed it. The sun was shining, the wind was cold. That combination served well to fly the orange ACT flags Jason Lucci and I (Michael Armes) carried along the way, but I’m sure Aristotle Domingo was feeling the effects as he went flying through on the special racing chair he was using for the run. After everyone crossed the finish line, we gathered for the team photo and even cheered on the last participant to roll across the finish line. The team, having enough of the cold, headed to Steamwhistle Brewery for warm chili and cold beer to celebrate the day’s achievements. 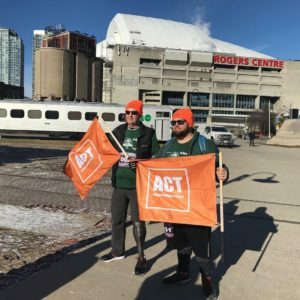 The Amputee Coalition of Toronto is and always will be about peer support and advocacy. In helping each other though, something amazing has emerged. Our family has turned outward to help the community around us. 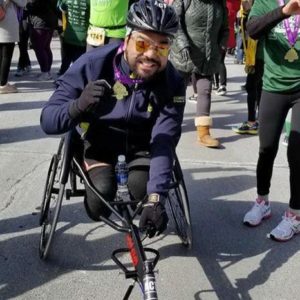 Even if you couldn’t participate on Sunday, you are very much part of this story. Be proud. Join us next year for the 21st Achilles St. Patrick’s Day run! 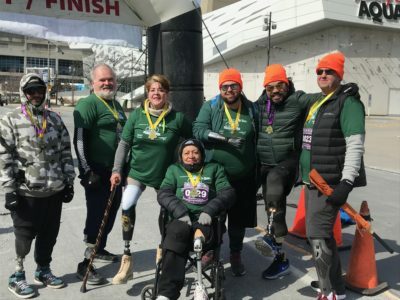 Amputee Coalition of Toronto welcomes all amputees in Toronto and the surrounding GTA to join our support group for more information on monthly meetups, upcoming events, and a safe space to share your journey. Thank you for allowing me to join your team. It was an amazing day!